Get Up to $100 Back by Mail with the Purchase of 4 WildPeak H/T, 4 FK453, 4 FK453cc, 4 PT722, 4 WildPeak A/T, 4 S/TZ05 or 4 ZE912 tires September 1st, 2013 through October 31, 2013. 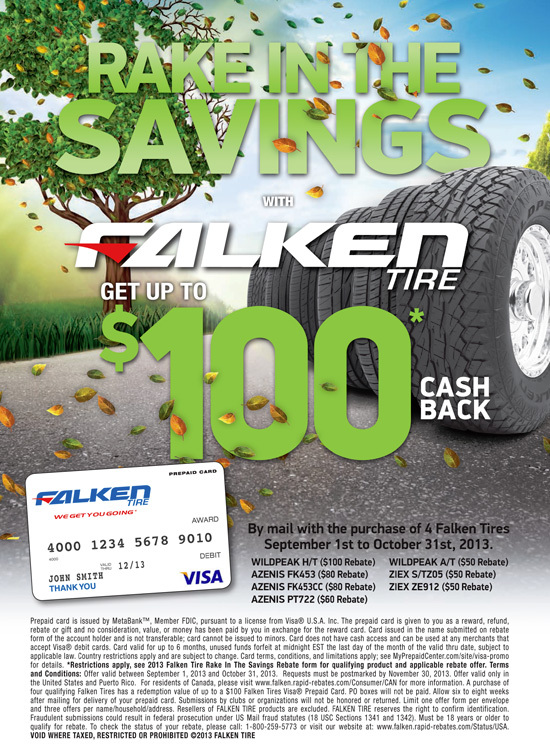 Click and save now on Falken Tires! 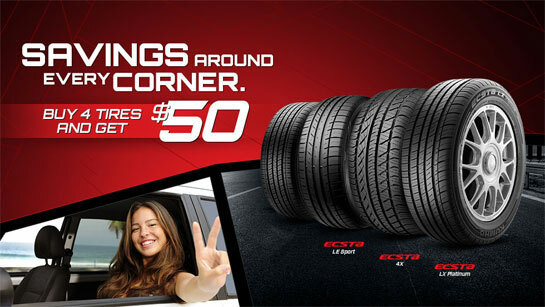 Receive a $50.00 Visa prepaid card by mail when you purchase a set of four Kumho Ecsta LE Sport, Ecsta LX Platinum, Ecsta 4X or Ecsta PA31 tires from September 1st, 2013 through October 31, 2013. Click and save now on Kumho Tires!